Learn how to grow bitter melon. Growing bitter gourd is easy. 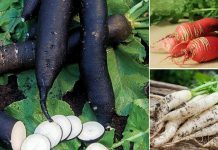 This healthy vegetable grows up quickly and fruits productively. You can also grow it in pots. Bitter Melon is one of the most popular vegetables grown in South-East Asia. Like cucumber, melon or pumpkin, it belongs to the gourd family. A native of the Indian subcontinent, it is used in Asian delicacies. It one of the healthiest vegetables and has many medicinal uses. It has a uniquely bitter and crunchy taste. This very short living tropical perennial climber with thin stems can grow up to 5 m in length. Like other plants of this family, it needs support. Both the stem and lobed leaves are hairy. Bitter melon produces yellow flowers, male or female, which are pollinated by insects. Bitter tasted fruits are eaten unripe when they are still green or slightly pale. They have delicate skin and can be eaten after cooking. Inside there are large seeds. The flesh somewhat resembles a cucumber and is watery and crusty. Seeds can be purchased online or in garden shops. You can also use seeds you get from ripe yellow fruits. Ripe seeds have a crimson red color coat. Germination is not difficult, but there are some tricks to make it faster. Seeds will germinate slowly in 3-4 weeks if you directly sow them without pre-treatment, especially at low temperatures. But to increase germination rate and for the faster germination, you have to scarify them to remove seed coat. For this, rub the seeds from one side without doing any damage to endosperm inside the seed coat. Soaking seeds for 24 hours in water before sowing will also help. Sow seeds 2 cm deep. Seeds can be sown directly into the ground or in the containers but only when the risk of frost has passed, and the soil warms up enough. Seeds require the temperature above 70 F (20 C) for germination. In temperate regions, best seed sowing time is summer, usually between late April to May. Whereas in tropics (USDA Zone 10, 11), you can start seeds anytime. There are two types of bitter melons. One from India, which is smaller in size and has spiny skin and the other one is from China. Chinese bitter melons are milder in taste, generally large and smoothly ridged. If you want the higher yield, choose hybrid variety. Growing bitter gourd (bitter melon) in pots is easy. Similar to squashes, cucumbers, and melons. You’ll need a 12 inches deep pot and a sturdy trellis. However, the bitter melon vine can grow more than 5 m (16 feet) long. A trellis or any other support structure that is at least 5-6 feet tall is required. Once the vine has reached that height, you’ll have to redirect it. This plant is cultivated in the same way like squashes, melons or cucumbers. Provide full sun to this vine, and it will produce heavily. Also, as it is a tall vine, you will need to support it. A tall trellis or a garden fence. If you want to grow it on your patio, terrace or balcony grow it near the wall so that it can go up along with it. It tolerates a wide range of soils, but prefers permeable, sandy loam soil that is very rich in organic matter. Bitter melon grows in slightly acidic to the slightly alkaline soil. The pH range around 6 to 7.1 is ideal. It can tolerate drought-like conditions for a short time but regular watering to keep the soil evenly moist is essential to ensure a good yield. In the initial phase of growth, growing bitter gourds require a temperature more than 70 F (20 C). Humid and warm temperature accelerate the growth of the plant. 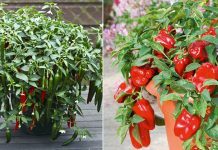 It is more resistant to low temperatures than other plants of this family but requires the hot temperature and humidity to grow. Overuse of nitrogen-rich fertilizers should be avoided, which could encourage the development of foliage at the expense of fruits. At the time of planting, you can mix slow-release complete fertilizer in the soil. Enriching the soil with compost or well-rotted aged manure and regular inputs of organic matter will be enough later. 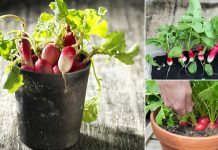 Still, if your plant is not growing well, you can feed it with liquid vegetable fertilizer once in a month. Bitter gourd perks up very quickly and within two weeks after planting you must arrange something to support it. 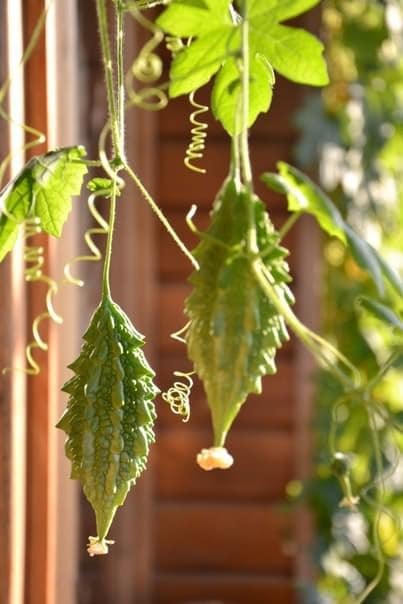 You can also grow this vine on pergolas, arches or arbor. 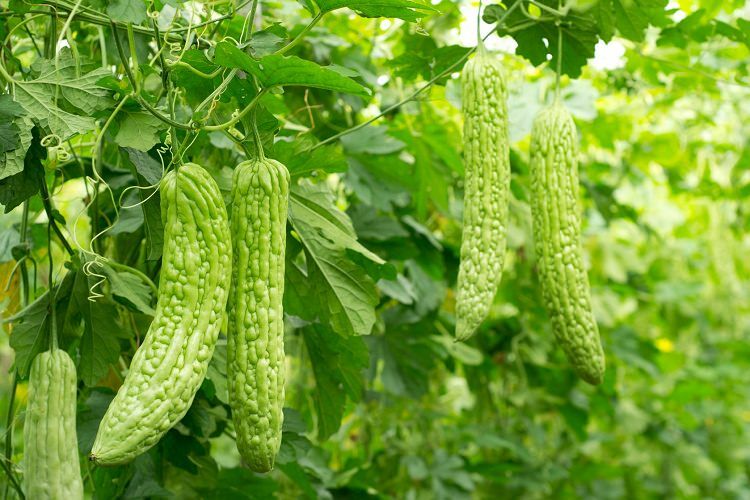 Growing bitter gourd vertically increases the yield and fruit size, moreover, in the case of growing horizontally on the ground, there is a high risk of fruit rot and fungal infection to the plant. The plant produces numerous side shoots, which must be removed to improve yield, remove the side shoots (lateral branches) until the runner reaches the top of the trellis. Leave only 4–6 laterals and cut the tip of the main runner to improve the productivity of the plant. In cooler climates, bitter gourds are grown as annual so you may not need to care about overwintering. Pollinators like bees do the pollination for you, be kind to them. If you don’t find pollinators around the flowers, you may need to hand pollinate them in the morning. Bitter melon starts to fruit quickly in 2 months. Harvest fruits when they are green, little pale and unripe and about the size of 3 to 6 inches (depending more on the variety and type). Within 6 to 8 weeks after the germination, you’ll see the blossoms, and in the next 2-3 weeks, fruits will appear and are ready to be picked. Very good information for growing bitter gourd. information will be very usefull for me. I have already planted on roof top in two pots. Thankyou for the information i hv already grown in a bit n hoping for better yield. Thanks for this information, its indeed helpful. i didn’t know how to grow this, but i’m going to try growing it. I live in CT, so I guess I will plant mine in late April. Thank you!